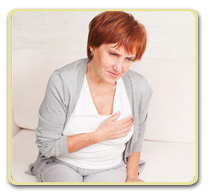 Is it necessary to undergo testing for fibrocystic breasts? 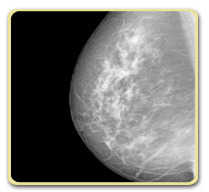 In most cases, a history and physical examination that is consistent with fibrocystic breast changes, is adequate to make the diagnosis. If there are any worrisome lumps, such as those that persist through several cycles, a mammogram and/or ultrasound should be performed. Any new lump in a post-menopausal woman requires evaluation, since this is unlikely to represent a fibrocystic change. In some cases, it may be necessary to obtain a sample (biopsy) of breast tissue with a needle or by surgery in order to make an accurate diagnosis and differentiate between a fibrocystic breast condition and breast cancer. Your grandma may have told you to put hydrogen peroxide or alcohol on a wound, but that is actually not a good idea. The instinct to kill germs with a strong antiseptic is understandable (how many times have we used alcohol-based, hand sanitizers -like Purell- as an alternative to hand washing?) However, broken skin that is bleeding or otherwise scratched, cut, or burned is very vulnerable to damage caused by these caustic liquids. You may kill the bacteria, but in the process you also kill your healthy cells that are needed to heal the wound. It's kind of like using a sledge hammer to kill a bug - it's going to do more harm than good. The best thing for simple cuts and scrapes is clean water and gentle soap. Wash your hands first and then rinse the injury for at least 5 minutes to get all the potential particles and debris out of it. After the wound is clean (in the ER we use copious amounts of sterile saline to rinse wounds) it's important to judge whether or not stitches will be required to help it close. Assuming it's a small cut or abrasion, the next step is to apply pressure to reduce bleeding, and then keep it moist, and covered with a clean bandage. Moisture allows repair cells to migrate across the broken skin and lay down new collagen. Without moisture, the wound bed dries out and crusts, creating a scab and a higher chance of scarring. ntain the wound in a moist environment and block air from getting in. Some studies suggest that wounds heal up to 10 days faster if they are kept moist, and scar reduction is significantly improved. These dressings (if undisturbed) can be left on for 1-3 days at a time, but should be changed right away if they're broken, soiled, or contaminated (such as dipped in dirty water). While the wound is healing, there will be a small inflammatory reaction as the repair cells do their job. Sometimes wounds are itchy or have slightly red or pink border. They may also leak a little bit of clear, sticky fluid. Those are all part of the normal healing process. However, if the wound is becoming more (rather than less) painful with time, if it has redness that is expanding, or if there is a foul odor or pus coming from it, it could be becoming infected which may require medical attention. 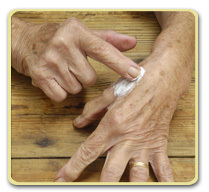 Antibiotic ointment (such as Neosporin or Bacitracin) reduces infection risk in minor contaminated wounds. Once a wound is fully washed and decontaminated, good old Vaseline (petroleum jelly) is just as effective in helping it heal. If you are injured far away from access to clean water and gentle soap, an antibiotic ointment may reduce your risk of infection (so long as the wound is not too large or dirty). Butter is not a good substitute for ointment because it is not sterile, by the way. The bottom line is that minor cuts, scrapes, and burns should be washed thoroughly and then kept moist with petroleum jelly and/or occlusive dressings. Antibiotic ointments are a precaution that isn't needed for otherwise clean wounds, and carry a small risk of allergic reaction. 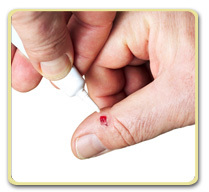 The stinging pain of hydrogen peroxide or alcohol in a wound is not the feeling of germs dying, it's the body crying out as you add a new chemical burn to an already painful situation. If you have any questions about first aid for wounds, please log into your account and send us your question. We are here to help. How do you keep a clean wound moist? Ideally with "occlusive dressings." Maybe you've seen the new kind of Band-Aids that are rubbery or gel-like in appearance? Those are designed to contain the wound in a moist environment and block air from getting in. Some studies suggest that wounds heal up to 10 days faster if they are kept moist, and scar reduction is significantly improved. These dressings (if undisturbed) can be left on for 1-3 days at a time, but should be changed right away if they're broken, soiled, or contaminated (such as dipped in dirty water).